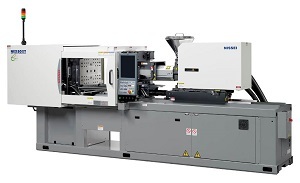 Japanese injection molding machine supplier Nissei Plastic Industrial bets on metal injection molding and sees vast potential for the technology particularly in China where the MIM processing industry is booming in recent years. Nissei’s MIM machine will be operating at a trade show in Dongguan, China. MIM has been used extensively by the mobile phone industry, and its application has also been expanding to the automotive and medical market segments according to Nissei. With its abundant experienced in metal injection molding MIM ability to explore the use of new materials, Nissei is seeking to tap into new markets while simultaneously receiving repeat orders from existing customers. Nissei will bring an MIM unit to the 17th DMP China Dongguan International Plastics, Packaging & Rubber Exhibition in Dongguan, China, from November 18th to 21st. 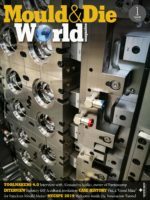 The NEX-IIIT Series 784-kN (80-tonne) clamping force electric injection molding machine is manufactured at the company’s Taicang factory in China and at the show, it will be molding SIM card holders using SUS630 stainless steel in a four-cavity mold. The machine features higher injection velocity, response, and pressure achieved by adopting a low inertia servomotor and a customized injection unit. Further, higher injection/plasticization precision and wider moldable range are materialized by optimizing the barrel temperature control. In addition, yield is improved by the high-precision metering control. Nissei’s linear pressure toggle system, meanwhile, possesses advantages of a toggle mechanism, particularly fast molding cycles, but it is also designed to possess performance similar to a hydraulic direct clamping machine: automatic clamping force adjustment and direct clamping force setting are featured as standard. Automatic clamping force adjustment automatically adjusts clamping force fluctuations caused by rising mold temperature during automatic operation, while direct clamping force setting permits changing of the clamping force setting during automatic operation.